Posted on Mon, Oct 24, 2011 : 6 a.m.
Thousands of University of Michigan students flock to hundreds of booths and tables set up on the UM Diag by various campus student groups and university departments at the start of last year's school year. When Pioneer High School records clerk Ellen Marshall processed college applications for Pioneer seniors last year, she was struck by the increase of applications to the neighboring University of Michigan. “Our applications to the University of Michigan were probably up 20 percent,” Marshall said. U-M’s switch to the Common Application. '; it’s just an easier process,” Marshall said. Marshall said other state schools, like Michigan State University or Western Michigan University, didn’t see the same level of increase in freshman applications. They also didn’t switch to the Common App. In fact, the U-M —which made the switch in 2010— is the only university in Michigan that uses the Common App. The pool of freshman applications to the University of Michigan reached 39,584 last year— a record high and a 25 percent increase. Spencer said much of that increase is due to the Common App. 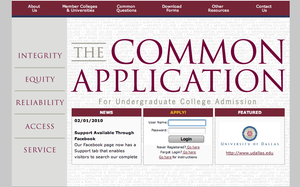 love the ease of applying to the university using the Common App,” he said. New Jersey native and U-M freshman Dylan Waldman agreed. She used the Common App for four of the eight universities she applied to. Alexis Daniels, a U-M freshman from California, said she used the Common App for nine of the 21 universities she applied to. “I had no idea where I wanted to go. I didn’t know if I wanted stay in-state or go out-of-state, private or public, big or small,” she said. Daniels said the Common App does have a downside. “You still have to write supplements,” she said. The Common App requires two unique essays for every school a prospective student applies to. It also makes admission more competitive. “It was harder to get in because of all the applications,” Waldman said. According to Spencer, U-M expects even more applications this year. 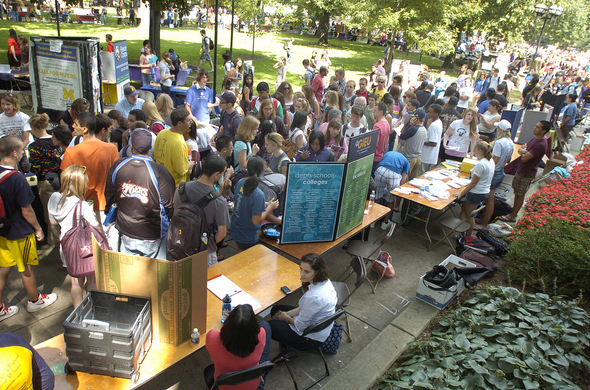 “We think next year will be a little bit larger,” Spencer said, predicting that freshman applications will exceed 40,000. Spencer also noted that more and more colleges are using the Common App. More than 500 colleges and universities now use it. Spencer said the biggest surprise in last year’s switch to the Common App was early applications; U-M saw a much bigger increase than expected. Last year, about half of the people who applied to U-M applied using early admission, which means an application deadline of Nov. 1. This year, Spencer says he expects that trend to continue. “Now we know that we’ll see more early applications,” he said. U-M offered admission to 16,073 students this year, but enrolled just 38.9 percent of those students— the smallest margin since 2006. Spencer said that’s because students who use the Common App apply to a larger number of schools than they would otherwise and often have several options. because we weren’t certain whether a lot of the students who did apply and had a strong resume would yield at the same rate,” Spencer said.